Cassie Brought Her Family To Say Hi! 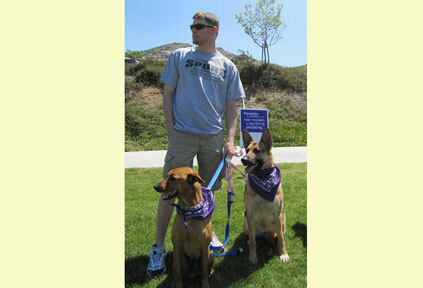 We were out at the Bark for Life Walk in Norco, CA this past Sunday, walking with/for a friend of ours. When our friends heard you all were going to be there, they ended up snagging a spot on the grass right next to your tent so that we could see you all. Cassie loved meeting all the dogs you had with you, and whereas Ronnie wasn’t too sure about them he was still polite and said hello. Todd and I would of loved to take one (or all!) of them home with us that day, but with a very strict 2-dog-only clause in our lease, we couldn’t. Just wanted to say thank you for all that you do – Cassie is an amazing dog and we can’t imagine our family without her!